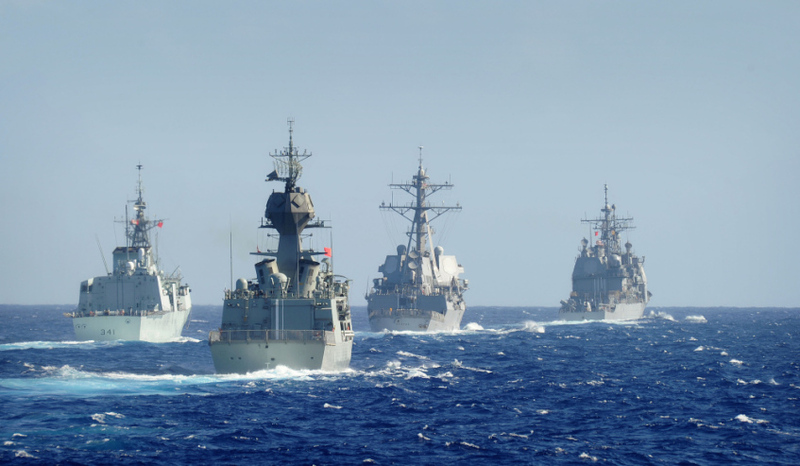 Mounting tensions between China and the US in the South China Sea has placed Australia at the centre of a great power showdown, which has raised questions about the suitability of the 2016 Defence White Paper and its capability and industry objectives. China has spent the better part of the last 20 years reassuring the Indo-Pacific region that its ascendancy would be peaceful. Buoyed by meteoric economic growth and an unrivalled cheque book, the ancient nation has decisively flexed its soft-power muscles through initiatives like the One-Belt, One-Road policy and the Asian Infrastructure Bank. However, many regional nations have remained suspicious of China and its rising influence. Increased Chinese assertiveness throughout the region, particularly in the Taiwan Strait and the international waters of the South China Sea (SCS) has brought the rising power into contest with both the United Nations and the broader regional community. The reclamation of islands throughout the SCS, particularly for military use despite claims to the opposite, combined with increased acts of intimidation and harassment of naval vessels and aircraft from the Philippines, Vietnam, more recently Japan and, most concerning, the US, has prompted a number of red flags to be raised. For Australia, the 2016 Defence White Paper (DWP) and its focus on supporting industry through the sovereign industry capability and naval shipbuilding plans sought to respond to increased regional tensions and forge a path forward, following nearly two decades of 'valleys of death', cost and delivery overruns and shrinking defence budgets. Despite the largest peace-time investment and recapitalisation of Australia's defence capability since the Second World War, the increased tension and recent direct confrontation between Chinese and US military assets has begun to raise eyebrows in Canberra and questions about the viability of the 2016 DWP as the foundation for the ADF moving into the 2020s. Recently, a Chinese colonel issued a stern warning to the US and its regional allies operating in the South China Sea and more broadly the western Pacific ocean where they may challenge China's increased territorial and economic ambitions throughout the regions. Dr Malcolm Davis of the Australian Strategic Policy Institute (ASPI) told Defence Connect, "2018 has been an interesting year in the South China Sea. It started fairly early on with the basing of anti-ship cruise missiles (ASCM) on reclaimed islands in the SCS, the basing of the upgraded, H-6K nuclear capable bomber on Woody Island and more recently the USS Decatur (DDG-73) incident really reinforces that China is not backing down from its territorial ambitions." This growing assertiveness and apparent disregard for international convention and United Nations agreements places increased pressure on regional nations and the security paradigm upon which the stability of Indo-Pacific Asia is built. China's bullying and intimidation tactics expand beyond direct military confrontation and thumbing their nose at international convention. The recent attempts by China to assert its influence and own wishes over ASEAN regarding the South China Sea Code of Conduct is particular evidence of this. "What we saw recently with the ASEAN discussion about establishing a code of conduct for operating in the South China Sea was essentially a push by China to prevent all foreign navies from operating in the area. Given the amount of seaborne trade that flows through the South China Sea, that was obviously an unacceptable outcome for both the US and Australia," Dr Davis explained. The combination of these diplomatic and military confrontations are further enhanced by the growing capability of the Chinese military which has embarked on an unprecedented period of modernisation and expansion across a number of key domains as it seeks to assert itself throughout the region. This modernisation, namely the development of key power projection capabilities, including aircraft carriers and supporting strike groups, fifth-generation combat aircraft, modernised land forces, area-access denial and strategic nuclear forces, combined with growing political and financial influence throughout the region is serving to shake-up Australia’s way of thinking. Australia's strategic reality has changed immensely over the past two years. The increasing instability in traditional allies like the US, UK and European partners combined with increased assertiveness by both China and Russia are serving to undermine the international balance of power and paradigm that the nation has enjoyed for the past 65 years. Speaking to Defence Connect, Peter Jennings, executive director of ASPI, was quick to point out that while the existing ADF was the most capable it has ever been, largely as a result of the material investment and operational engagements of the last two decades, there was room for improvement, should Australia need to operate alone, or with limited allied support. "We need to be placing more effort into developing the ADF's long-range strike capability. This includes things like cruise missiles which can launched by platforms across the ADF. We also need to place greater emphasis on upgrading the capability provided by Collins, not just as a stop-gap, but as an imperative, as these submarines will continue to form the point of our deterrence spear for some time yet," he said. Dr Davis reinforced these comments, making particular note of the mounting tension between the US and its 'Western' alliance network and the rising authoritarian powers of Russia and China. "We are seeing an increasing level of tension between the Western alliance system, led by the US and the more authoritarian regimes like China and Russia, highlighting the potential for great power conflict. What this is doing is serving to shine a light on the inadequacies of the 2016 Defence White Paper," Dr Davis told Defence Connect. Building on this, Dr Davis noted growing concerns about the similarities between the pre-World War II era and events currently evolving throughout the region, saying that many nations like Australia and Japan were starting to realise that the world is potentially entering a 'pre-war period'. In doing so, he highlighted the growing concern about the viability and suitability of the 2016 Defence White Paper, the ADF's planned force structure and critically, government financial support into the future should the strategic realities continue to degrade. "The government aspiration of spending 2 per cent of GDP on defence is simply not enough any more. We need to look at planning our force structure, our capability requirements and spending on a number of factors, including allied strengths and potential adversarial capabilities, not arbitrary figures," Dr Davis explained. For Dr Davis, this necessity for funding increase means it is time for Australia to ask itself some tough questions about the nation's military capability and its strategic intent towards the region. "It is time for us to throw open the debate about our force structure. It is time to ask what more do we need to do and what do we need to be capable of doing?" he said.